Hummingbirds savor the nectar of Salvias of which there are approximately 900 species, all of which are known as "true sages." Regional differences in seasonal temperature and humidity affect the choice of sages to plant in your hummingbird garden. The varying seasons in which particular sages bloom and the part of the world where they originated also determine whether they will attract these tiny birds that early Spanish explorers of the New World named joyas voladores -- flying jewels. 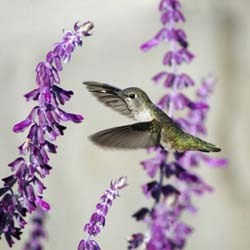 The kind of hummingbirds you can expect state-by-state varies, but all seem to love a wide variety of Salvias -- especially plants native to the Western Hemisphere. Recent research shows that hummingbirds emigrated to the Americas from Europe about 22 million years ago and never returned. They settled in South America and began working their way northward. Our suggestions here are based on growing conditions in different regions of the nation as well as the kinds of New World Salvias that are either native to or do well in those areas. For example, the Anna’s hummingbird often spends the winter in coastal California, partly because numerous native, winter-blooming sages grow here. However, there are no winter bloomers for areas such as the Rocky Mountain West, the Midwest, New England and the Mid-Atlantic where flowering perennials generally are dormant during cold months. We've organized lists of hummingbirds common to different regions and sages that appeal to them. However, here is a more comprehensive set of hummingbird lists state by state that was last updated in 2015. The lists in this article shouldn't be interpreted as implying that no other hummingbirds visit the areas cited, especially since changes in climate are causing migration patterns to shift. Also, please note that all the sages listed here are native to some part of the U.S. unless marked as "non-native." When "spp." appears in scientific names, it indicates multiple species exist and also implies that we grow a number of varieties. Salvias thrive on the West Coast, particularly in California. Overall, the genus is known for being long blooming, so many species flower over multiple seasons. A number of California natives that bloom from winter into spring are good for attracting Anna’s hummingbirds as winter residents. Although most of the sages listed here are California natives, some are not. Their common ground is a Mediterranean type climate of USDA Cold Hardiness Zone 9. However, depending on species, some tolerate the chill of Zone 7 and others can take the heat of Zone 11. This region actually encompasses a large part of the Southwest, which includes Southern Colorado, New Mexico and Utah. Salvia azurea – known commonly as Prairie Sage, Pitcher Sage and Azure Blue Sage – is native to all three states and does well in chilly Zone 5. However, it isn’t a hummingbird magnet like its close relative Big Pitcher Sage (S. pitcheri grandiflora), which does just fine in Zone 4. As to hummingbirds, sightings vary state by state within a region, so there may be some species present in your state but not in the state next door. The hummingbirds listed for this region are commonly found in Colorado, New Mexico and Utah. Among the sages best known for bringing hummers to Southwestern gardens in Arizona are varieties of the native Mountain Sage (S. microphylla), which is closely related to the equally varied hummingbird favorite Autumn Sage (S. greggii). Salvias, including non-native species, proliferate throughout Texas. Some, such as the native Tropical Sage (S. coccinea), do well in dry or humid conditions. Tropical Sage flourishes from Texas to Florida. The native Orange Mountain Sage (S. Regla) also can swing from dry to damp conditions. Although a larger variety of hummingbirds have been recorded in Texas than in Louisiana, Cornell University calls that state’s capital, Baton Rouge, the “winter hummingbird capital” of America due to seven species wintering there. If you live in America’s heartland, you don’t have as many kinds of hummingbirds as further south and west. However, you do have a hummingbird favorite among your native plants – Pitcher Sage (S. pitcheri), which some folks call Blue Sage. One variety with large blossoms to delight hummers is Big Pitcher Sage (S. pitcheri grandiflora). You may also be in the habit of planting a number of the Salvias already described here, but you probably grow them as annuals or tender perennials. In particular, Midwesterners praise Autumn Sage, Tropical Sage, Anise-Scented Sage (S. guaranitica spp.) and Scarlet Sage (S. Splendens). Similar to the Midwest, New England and the Mid-Atlantic are mostly home to Ruby-Throated Hummingbirds and receive occasional visits from the rusty red Rufous. The only Salvia native to the region is Lyreleaf Sage (S. lyrata), which is also commonly called Cancerweed due to its medicinal properties. Many Salvias that are non-native to the East Coast are becoming increasingly popular there due to long bloom, wide color range, adaptability to use as annuals and ability to attract hummingbirds. The species mentioned here are popular both in New England and the Mid-Atlantic. VIBE® Ignition Purple Jame Sage (Salvia VIBE® ‘Ignition Purple’). Here is our complete current list of annuals and tender perennials. If you want to invite hummingbirds into your yard, it helps to grow a garden buffet of tempting, nectar-rich plants. Certainly, you don’t need to limit your choices to the Salvias we’ve mentioned here. Instead, go ahead and dare to experiment by planting a sage that is unfamiliar but meets your local conditions. Visit the Hummingbird Plants section of our online catalog for ideas. You'll find it listed in the dark green menu bar on each page. Then, please contact us. We’ll be glad to answer questions and swap hummer stories with you.